The 29th Mt Kinabalu International Climbathon has been cancelled as the mountain trail used was damaged by the earthquake earlier this month, Sabah Tourism Minister Datuk Seri Masidi Manjun said today. Masidi announced on Twitter the cancellation of the annual event that was set to take place this October 17 and 18. 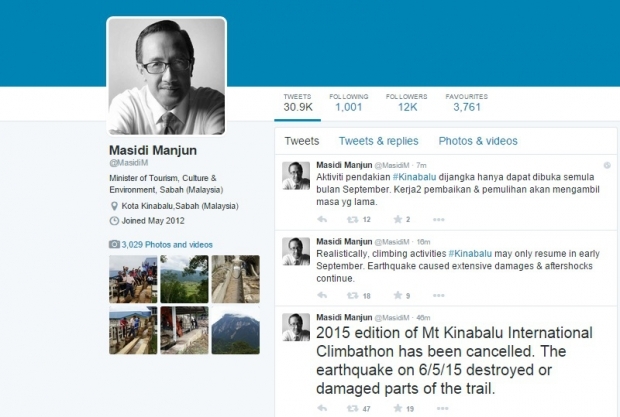 “2015 edition of Mt Kinabalu International Climbathon has been cancelled. The earthquake on 6/5/15 destroyed or damaged parts of the trail,” the state minister of tourism, culture and environment said. According to the event’s official website, two different races courses are available: the 33km summit race for elite and qualified runners on October 17, and the 23km adventure race on October 18 open to all aged above 18 and veteran runners above 35 (women) or 40 (men). Last year, 741 participants from 31 countries registered for the 28th climbathon. Today, Borneo Post Online reported Malaysian Association of Tour and Travel Agents (MATTA) as directing its members to provide full refunds for Mount Kinabalu climbs that were cancelled after an earthquake recently killed 18 climbers on Southeast Asia’s highest peak. Borneo Post Online reported MATTA vice president Datuk Tan Kok Liang as saying that the refunds will be provided for climbs that were scheduled between June 5 and August 31, adding that the tourism ministry’s licensing division may query any travel agents that refuse to cooperate. Sabah, particularly the Kundasang and Ranau regions, has continued to be rocked by aftershocks ― the biggest being one measuring 5.1 magnitude ― since a 5.9-magnitude quake hit Sabah on June 5, killing 18 climbers on Mount Kinabalu. Yesterday, another tremor measuring 4.3 magnitude was recorded in Sabah, the 89th aftershock there since the June 5 quake. Damage from the aftershocks so far include rockfall, mudslides, landslides and cracks to buildings including schools in the area. Villagers at the foothills of Mount Kinabalu have been traumatised by the quake and its subsequent aftershocks, many claiming they are not able to sleep at night for fear of another quake.